Our tours provide a unique opportunity to combine adventure with discovering ancient Armenian culture, amazing mountainous scenery and primordial nature. The season for motorbike tours in Armenia is from April 15 to October 15. 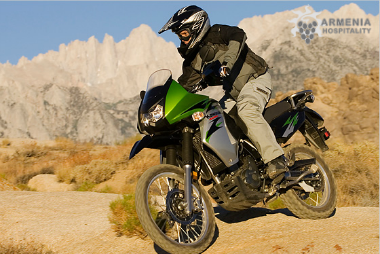 The tours take place on Yamaha XT660 or/and Kawasaki KLR65 motorcycles accompanied with professional guide on motorcycle and an support vehicle. Length: 1000 km. 6 days, 5 days of riding. Arrival in the capital of Armenia, Yerevan. Check –in in hotel. Yerevan City tour. Familiarization with motorcycles in the garage. Arrival at the garage at 8:00. We start our journey towards resort and mountain spa town of Jermuk. The southern Armenian province of Vayots Dzor Province, 53 km east of the provincial capital Yeghegnadzor.Stops: medieval cemetery in Noradus village with large numbers of Armenian khachqars – outdoor steles carved from stone by Armenian craftspeople (UNESCO World heritage), caravanserai on the Silk Road built in 1332. Overnight in Yeghegnadzor. Going by M2 highway up to the divarication of the road near Shurnukh Village. Taking this dirt road with numerous serpentines running through picturesque mountains. There is a small church on the road, Bgheno-Noravank. Finally, at Shinuayr Village, taking the direction towards Tatev Monastery. 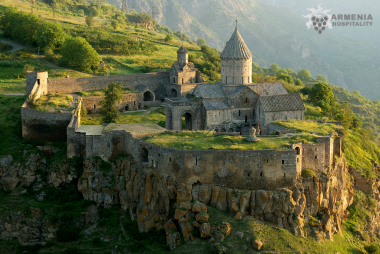 The Tatev monastery is a 9th-century Armenian Apostolic monastery located on a large basalt plateau in Syunik Province of southeastern Armenia Tourists can choose to ride on Europe’s longest cable car inscribed in Guinness World Records book. After the visit of the monastery riding to the city of Kapan through mountain villages and lake Kashuni. Overnight in Kapan. Departure from Kapan to the south through Shikahogh Reserve towards the border with Iran. Making a big loop through the beautiful mountain road (160 km) going back to Kapan. Kapan is a picturesque town in southeast Armenia and the capital of the Syunik Province. It is located on the northern slopes of Mount Khustup. Continue to Goris. City of Goris was possibly the first build in a net layout in Armenia, with a very fancy regional style of Armenian stone architecture. Stops: alley of plane trees, town Meghri, near the boarder with Iran. Overnight in Goris. 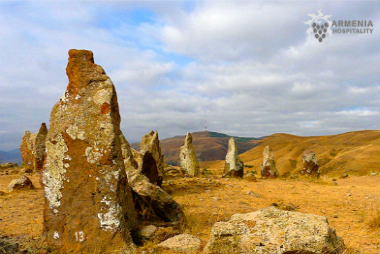 Departing from Goris and going to the prehistoric monument “Karahunj” Stonehenge also called “Zorats Qarer” which is 3 500 older then England’s Stonehenge and 3, 000 years older than the Egyptian pyramids. The total area of the observatory is 7 hectares. According to the scientist’s findings, a temple consisting of 40 stones built in honor of the Armenians’ main God, Ari, meaning the Sun. It is situated in the central part of Carahunge. Next: visit to the abandoned old settlement of Khndzoresk on rapid slopes of a gorge. Going to Yeghegnadzor through Herher Reserve. We will stop at the beekeepers to try delicious honey. Overnight in Yeghegnadzor. Returning to Yerevan. On the way, turning to the scenic road. Visiting 13th century Armenian monastery Noravank. Next stop: Khor Virap church at the foot of Mount Ararat. Afterwards going to the village of Garni to see the ancient temple of 1st century and then the unique Geghard Monastery (UNESCO World heritage) partially carved in the stone. Back to Yerevan. Farewell dinner with Armenian delicious national cuisine and music in the evening in Yerevan. End of the tour, transfer to the Zvartnots airport.